NOTICE: Currently we are only working with outside teams or teams of North Seattle Baseball for extended rental periods. We are not open to the public. This new facility offers 5 batting cages, pitching mounds, full floor field use for both baseball and softball for all ages and groups or teams. When the cages are pulled back there is ample room for field practice. NSBC will offer you one of the finest indoor batting cage facility’s for softball and baseball in the Seattle Metro area. 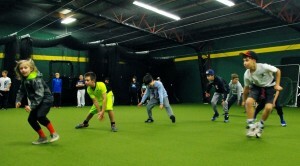 NSBC is the training facility for North Seattle Baseball. As a youth baseball organization with teams from TBall to 18U select teams we are the only youth league in the Seattle area with their own indoor facility. This gives all of our teams the opportunity to advance faster and not face the normal weather issues of the Northwest. We encourage you to review information about our league at www.northseattlebaseball.com. Conveniently located off I-5 in Lake City at NE 125th Street. We have highly regarded professional instructors who work with both teams and players.